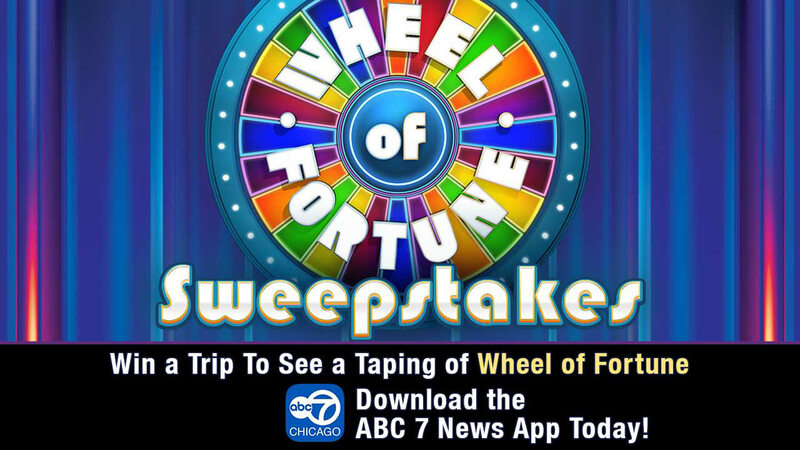 CHICAGO (WLS) -- Download ABC 7 News App for a chance to win an incredible Wheel Of Fortune prize package. CLICK HERE TO DOWNLOAD THE ABC 7 Chicago APP NOW! The ABC 7 News App guarantees you'll be up-to-the minute on news, but it will also give you a chance to win a phenomenally fun WHEEL OF FORTUNE SWEEPSTAKES prize package! By downloading the ABC 7 News app, seven lucky WHEEL OF FORTUNE fans and their guests will get a chance to win a trip to Los Angles for a WHEEL OF FORTUNE Great American Cities VIP taping, enjoy three nights of hotel accommodations at the Hilton and if that isn't enough -- pocket $1,000 in spending money! Viewers are welcome to download the ABC 7 News App between February 20 through February 28th at 11 PM to enter the WHEEL OF FORTUNE SWEEPTSTAKES. To enter click on: http://woobox.com/uho4tz. Seven prize winners will be selected on March 1, 2017 at 9 am. Official rules and Winner's List: http://woobox.com/offers/rules/uho4tz. Winners will be traveling to Los Angeles in March to redeem their prize package. The Great American Cities Tour - Chicago Week will May 15 through 19th at 6:30 PM on ABC 7. WHEEL OF FORTUNE airs weekdays on ABC 7 at 6:30 PM following ABC 7 Eyewitness News at 6:00 PM.